Pius Schwizer (SUI) took a second win of the weekend at the Longines Global Champions Tour, aboard Premiumares’ About A Dream. There was double cause for celebration, as owner Milena Pappas also celebrated her Birthday today, as the second day of competition kicked off. 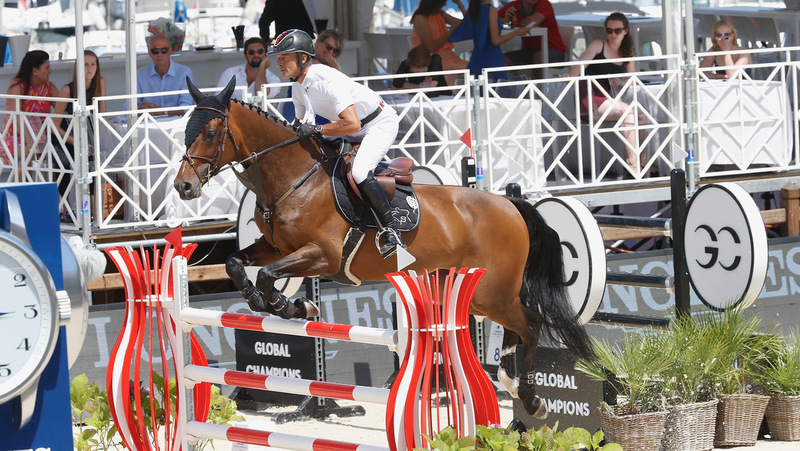 Speaking after his round, Schwizer said: “About A Dream is a great horse, not spooky, but is very good here. It’s a tough arena, with many horses spooking, but we were good today!" The fences came thick and fast, leaving zero room for error in the Frank Rothernberger designed course. Clears were far and few between, with only six in the 32 strong field, with many hard luck stories as horses looked around the compact, eye-catching arena. First to go Wout-Jan van der Schans (NED) set the competition alight with a speedy clear aboard D’ Angelo, setting the time to beat at 53.03s. Dutch rider Eric van der Vleuten (NED) put in a brave try with Zigali P S to smash his compatriot’s time by over three seconds, with a new lead in 49.56s. Pius Schwizer (SUI) with About A Dream put in a speedy clear, driving forward throughout the course with the Swiss rider looking on strong form this weekend after a win in yesterday’s speed class. Flying through the finish gates, they shaved almost another second off the time to beat, stopping the clock in 48.93s and raising the bar for the field to follow. Edwina Tops-Alexander (AUS) with Cinsey went for a steady clear, a relatively new partnership, picking up a time fault, as did Mark McAuley (IRL) with Vivaldi du Theil. There were a few disappointments, after Nayel Nassar (EGY) took a tumble from Emilie de Diamant A S, and Pieter Devos (BEL) with Apart opted to retire. Olivier Robert (FRA) with Vangog du Mas Garnier, Christian Kukuk (GER) with Botaro and Michael Whitaker (GBR) with Valmy de la Lande all pulled out clear rounds, but none could match Schwizer’s time, leaving the Swiss star triumphant in the second day’s opening CSI5* class.